Even more of the most beautiful and successful Formula 1 race cars in history, presented in a way they have never been seen before. Formula 1: the pinnacle of motorsports. This is the world's most popular form of racing, featuring the world's greatest drivers competing in the most technologically advanced cars ever created, machines designed and built by some of history's most brilliant engineering minds. 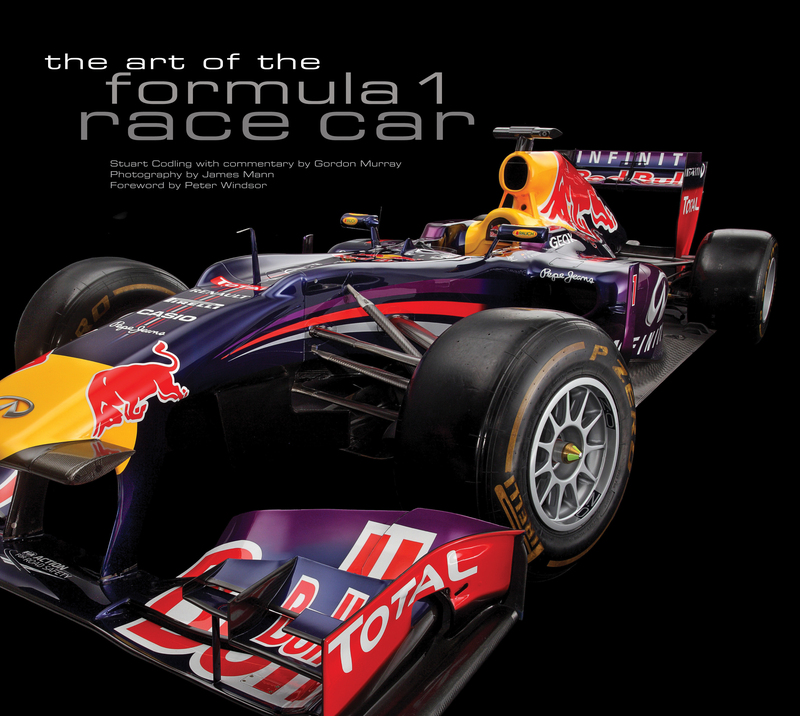 For the original edition of Art of the Formula 1 Race Car, master automotive photographer James Mann brought a selection of these spectacular machines into the studio, portraying not just their engineering brilliance, but also their inherent beauty-- the fascinating results of Formula 1's mix of competition, creativity, and human ingenuity has made these vehicles into works of art. Now, in this new and updated edition, Mann has gone behind the lens once again to bring you even more of history's most astounding racing vehicles, from the Alfa Romeo 158 that carried Giuseppe Farina to the first F1 world championship in 1950 all the way through to the present day, with models from Maserati, Mercedes-Benz, Lotus, Ferrari, McLaren, and all of racing's premier Formula 1 engineers. With historical and technological profiles by Formula 1 writer Stuart Codling and insightful commentary from designer Gordon Murray, creator of multiple championship-winning cars, the revised and updated Art of the Formula 1 Race Car continues its tradition as the ultimate homage to the ultimate breed of race car. Discover what Road & Track magazine called the perfect blend of pictures, analysis and the racing history of these remarkable racing machines. Stuart Codling is one of Formula 1's pre-eminent photojournalists. His twelve-year career in motorsport has taken him from riding pillion with World Superbike champion Neil Hodgson to snowboarding with FIA President Max Mosley--and being shouted at by Eddie Irvine. He has worked in Formula 1 since 2001, writing for the world-leading magazines Autosport and F1 Racing. This is his first book.James Mann is one of the world's leading car and motorcycle photographers, with more than twenty years of experience shooting for car and bike publications, the motor industry, and businesses all over the world. His work has appeared within and on the covers of more than forty books and has provided stunning visuals for numerous magazines, including Classic and Sportscar, CAR magazine, Automobile Quarterly, Autocar, Motorsport, Automobile magazine, and many others. His advertising clients include Aston Martin, Rolls-Royce, BMW, and Toyota, amongst others. James is the author of the Motorbooks title How to Photograph Cars. Visit his website at: www.mannphoto.co.uk.James Mann is one of the world's leading car and motorcycle photographers, with more than 20 years of experience shooting for enthusiast publications, the motor industry, and businesses around the world. His work has appeared within and on the covers of more than 50 books and has provided stunning visuals for numerous magazines, including Classic and Sports Car, CAR magazine, Forza, The Sunday Times, and Automobile magazine as well as being chosen to photograph the British Auto Legends stamps for the Royal Mail. His advertising clients include Aston Martin, BMW, and Toyota, among others. James is the photographer of the Motorbooks titles Art of the Formula 1 Race Car, Form follows function: Art of the Super Car, Art of the Le Mans Race Car and The Art of Ducati. Visit his website at www.jamesmann.comStuart Codling is one of Formula 1's pre-eminent photojournalists. His twelve-year career in motorsport has taken him from riding pillion with World Superbike champion Neil Hodgson to snowboarding with FIA President Max Mosley--and being shouted at by Eddie Irvine. He has worked in Formula 1 since 2001, writing for the world-leading magazines Autosport and F1 Racing. This is his first book.James Mann is one of the world's leading car and motorcycle photographers, with more than twenty years of experience shooting for car and bike publications, the motor industry, and businesses all over the world. His work has appeared within and on the covers of more than forty books and has provided stunning visuals for numerous magazines, including Classic and Sportscar, CAR magazine, Automobile Quarterly, Autocar, Motorsport, Automobile magazine, and many others. His advertising clients include Aston Martin, Rolls-Royce, BMW, and Toyota, amongst others. James is the author of the Motorbooks title How to Photograph Cars. Visit his website at: www.mannphoto.co.uk.Journalist and broadcaster Stuart Codling has worked in motorsports for over a decade, covering sports cars in the United States before joining F1 Racing, the world’s best-selling Formula 1 magazine. He has ridden pillion with World Superbike Champion Neil Hodgson, gone snowboarding with (former) FIA President Max Mosley, and been sworn at by ex-Ferrari F1 driver Eddie Irvine. He has appeared as an F1 expert on TV and radio, has hosted for Renault F1, and contributes to F1 Racing, Autosport, and Autocar. He is the author of the Motorbooks bestsellers Art of the Formula 1 Race Car and Real Racers. Read more about him on his website: www.stuartcodling.com.